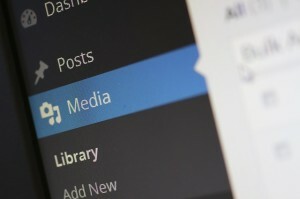 WordPress isn’t just for blogging anymore. The web software, which is built and maintained by hundreds of community volunteers as an Open Source project, started as a blogging platform but has since transformed into a full content management system for websites. It features quick installation and thousands of plugins and widgets and themes. With the help of a professional WordPress designer and developer, you can completely customize a WordPress template to fit your brand, and still have all of the sophistication of a much more expensive, custom-built website. WordPress is for everyone! Whether you’re a small business start-up, an e-commerce retailer, or a company with an extensive database, WordPress can handle pretty much anything. Your WordPress website can be as custom or as simple as you like. So why pay thousands upon thousands of dollars on a new or revised website, when you can have a fully customized WordPress website for less? Let’s look at the process involved in building a WordPress site, along with all of the options available to make your website your own. One of the starting points of your new website is choosing a theme, or design, that fits your business. WordPress offers more than 2,500 WordPress themes on its website, available for instant download, and new themes are constantly added every day. You can search by style or layout to find the perfect WordPress theme for your website. Some of them include drag-and-drop functionality, while all offer some sort of theme panel with theme options to allow your designer to create your website’s unique design. Most WordPress themes include ongoing updates with future improvements or enhancements, so you’re never stuck with an outdated version. If you’re after a more premium WordPress theme, you can search from many professional WordPress theme companies, such as Woo Themes, Elegant Themes or StudioPress, and pay less than $100 for a premium theme that your web designer can download and customize with your logo, colors, photos, graphics and more. Does this theme look close to the final design I’m seeking? Do I need photos to be prominent on my home page and throughout the website? How will my customers navigate the website? Does this theme seem to work with the number of pages I’ll need? Should my blog be prominent and visible from every page of my site? Does this design work with my industry or product/service? Does the theme have a good support team for updates or issues? The good news about WordPress websites is that you can change your theme at any time without much effort, and your developer/designer can help you get the look you want for your website, and enhance it over time. With thousands of WordPress web designers out there, it’s important to find the right person or company to develop your custom WordPress template. Here at Hubstaff, our team of WordPress designers and developers has successfully completed more than 40 WordPress websites, and counting, but our designers have years of combined experience building WordPress sites. We can help you choose the right developer for your project, who can walk you through every step, from brainstorming ideas, to choosing a theme, developing the wireframe, and bringing your ideas from concept to completed site. Our time tracking software also gives you complete transparency into your project as your WordPress development team works on your website. Visit our WordPress development staffing page for more information about building your custom site. Don’t let your lack of understanding about WordPress keep you from having a great, fully customized website at a fraction of the cost of another type of custom-developed site. Professional developers can still make your WordPress website stand out to give your business the impression it needs. In addition, WordPress sites are fairly easy to update, so you won’t be slave to your developer for future content changes and additions. So take a look at WordPress and I bet you’ll be pleasantly surprised at the quality of the results. Get Your Expert WordPress Developer Here.